When catching up with Nomad brewer Brooks Caretta upon the release of Freshie, the brewery’s salt and pepper gose, he admitted that he’d never actually brewed a gose before but, considering he’d gone and dumped buckets of seawater in the beer, was pretty pleased with how it turned out. Some 18 months after that release, Freshie hasn’t left Nomad’s menu and it seems set to be the brewery’s sleeper hit, having already been exported as far afield as the UK, US, Italy and even Brazil. It’s also now packaged in cans and, what’s more, it’s got a new companion. 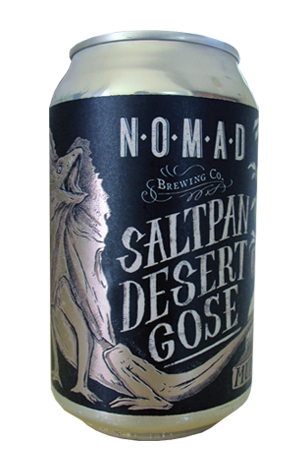 Saltpan Desert Gose takes its basic inspiration and structure from Freshie, with a couple of notable tweaks: in place of pepper comes desert finger lime, in place of sea salt comes pink salt from the Murray River, and coriander is a whole new feature. On paper it’s a slightly baffling combination that, like the frilled-neck lizard on its artwork, might have the effect of being a bit showy and frightening a few people away. But, as with its marine counterpart, Saltpan keeps all its unusual elements tightly entwined to form an eminently refreshing, surprisingly easy drinking and enduringly interesting beer. While it mightn’t be to everybody’s tastes, you can't help but conclude that there’ll be plenty of people cracking a can of this over summer and being most pleasantly surprised.